Patrice's Ponderings: Couch Potato No More! Given the chance, I'll stay in my robey most of the day, with only short forays away from the couch or rocker to eat, run errands, tutor students, and empty the hound. Exercise, to say the least, has never been my passion. There was one major exception.... Five summers ago I completed Seattle's Danskin Triathlon -- an amazing experience that happened purely because the thought of it (especially the .47 mile Lk. Washington swim) terrified me. I trained with an incredible group of beautiful, diverse women -- the Kitsap Tri Babes -- for 12 weeks, swimming, race-walking and biking, and I loved it (well, maybe not the swim so much, but...). Then, after the life-changing August event, I sat back down. We all know that sitting is not the road to living a long, active life, so it's time to get off of my rapidly-softening rear again. Menopause seems to be in full swing, and my metabolism is beginning to crawl in time to that music. At almost 54, along with many people at this age, I'm beginning to think about the upcoming second half of my life. While I've always been a bit of a health nut, I'll admit to having known much more than I've practiced. It is time to step up my game. The movement I most enjoy is walking. From strolling to race-walking, I like it all. Walks with my pup are stop-and-go exercises with frequent visits with other dog-walkers for neighbourly catch-ups and fascinating sniffs. 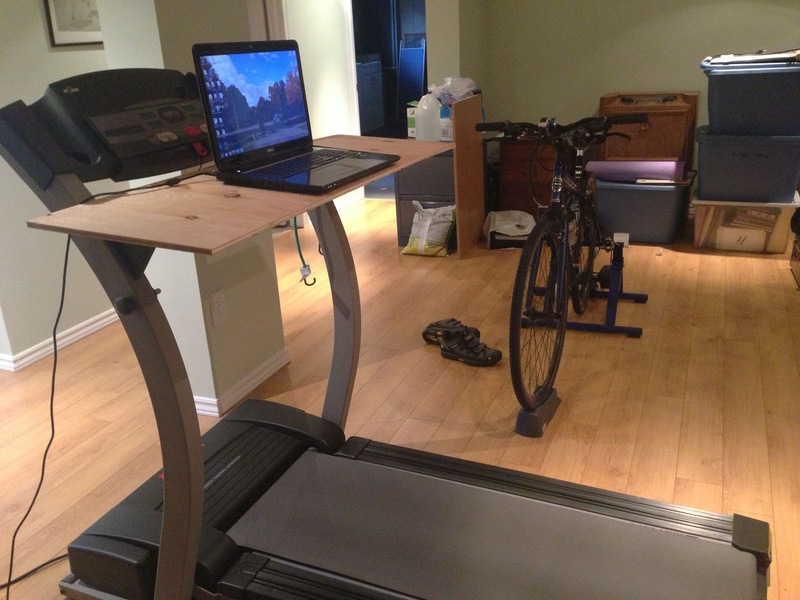 To supplement those non-aerobic, brief in the hot- and cold-season jaunts, kijiji provided a low-cost used treadmill last weekend, to which I've added a lovely first-phase hunk-o-plywood desk. So, at this very moment, I'm moseying at about 1.5 mph -- have been for the past hour -- and will amp it up this evening for another 1/2 hour with Pierre on his bike trainer beside me. While I doubt there is another triathlon in my future, (unlike one of my fellow Tri Babes who went on to complete an Ironman last year!) Ottawa holds a number of 5k's, 10k's, half- and full-marathons. And I plan to greet next spring and summer with a stronger, healthier body, ready to cross some finish lines. :) Would you like to join me? Good for you girl! Keep that body going for another 50+! When I first read this I thought it said 15 (fifteen) MPH and I could not imagine how you were texting at the same time, lol. You're always an inspiration to me, Patrice - maybe it's time to fire up my old treadmill again. MAYBE. :-) Happy Thanksgiving ! Thanks so much for your support, Monique! I'm hoping for at least 50 more. And you, too, right? Hahaha, Winnie! The font can be a little confusing. Not sure I could even run 15 mph! Do let me know if you hop back on your treadmill. We can give each other rah-rahs. Happy Thanksgiving to you.